I love to rescue plants, either from a grocery store sale, end of season clear- out or those that are failing to thrive in one place in my yard, just because. Sometimes, the best plants are the fighters who may have been disadvantaged at first. Pedigree does mean something. I have some awesome little boxwoods that you just know to look at them -they came from a loving home and very good stock. I own a certified survivor plant. A rhododendron bush about one foot tall was sitting in the front yard of the house when we bought it- probably as part of the home sale beautification effort. It never grew an inch, until I finally dug it out and relocated it across the yard, where it was fed annually with Hollytone. It soon grew like crazy. Almost seven years later, it’s now about five feet tall and throws up green leaves every spring. It has NEVER bloomed. Every year at some point I have a little chat with it about end of life, how I’ll give it one more year before I dig it out in shame. 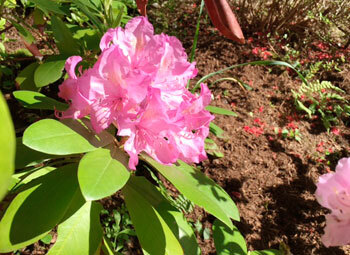 This afternoon, standing in the yard, looking across at a giant azalea bush blooming in front of it, I saw it. A single large flower. The damn bush has now cemented its permanent home in my yard if it never blooms again. Clever plant. I’m a sucker for survivors. The little white hosta I bought last year and planted in the fall of 2016. It looks like it’s been dying since I planted it. Aphrodite, she’s called. 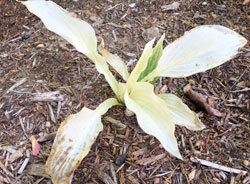 I had great hopes for a white hosta plant. What a treat. We’ll see if she makes the season. Plants make their own way in their own time. My job is to offer encouragement, be alert to the possibility that I found the wrong place for them, and move them if need be. Moving plants works really well for some. Our small lilac tree bloomed prolifically this year. It was very carefully moved a couple years ago where it was stuck next to the corner of the house. Now it’s the formal garden centerpiece. No pressure and it’s crazy good looking this year. Indoor plants offer a slightly different challenge. You’re way more in charge of their lives. There is little an indoor plant can do for itself. If it doesn’t have the right growing condition it might quickly die. It’s been written that people need plants that fit their personality. I don’t know. What do you think? I can live with many kinds of plants and not others. Is it me or them? Or both. Maybe we’re just incompatible. 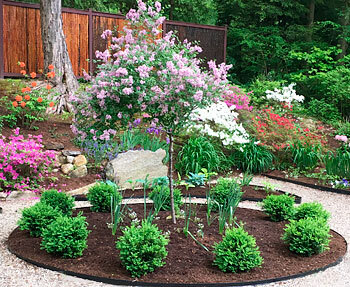 When plants land in the right place with the right light and water, they’ll thrive for years until you have to repot them. Cacti are like that. I’ve grown to really appreciate their quiet independence given the right conditions. Very self sufficient with little fuss. The polar opposite of young girls for example. Gloria Gaynor had a big disco hit with “I will survive.” Her song became known as an anthem for female emancipation. She was born in Newark NJ and moved to the projects at age eleven. As with many musicians, she was exposed to music at a very young age- her dad played ukele and her brother sang gospel. Unlike other musicians, she says, she had a desire to sing all her life but it went unnoticed by her family. Until she went after it. Roses as plants, suffer through a lot. I used to grow tea roses and recognize them for the work they require. Growing beautiful, scented flowers ( my rose) was challenging. At least twice, I exited the morning to discover that every single bud on ten plants has been chomped by deer. Sadly, our property today isn’t very sunny, so places to grow roses are scarce. Lucky for me. 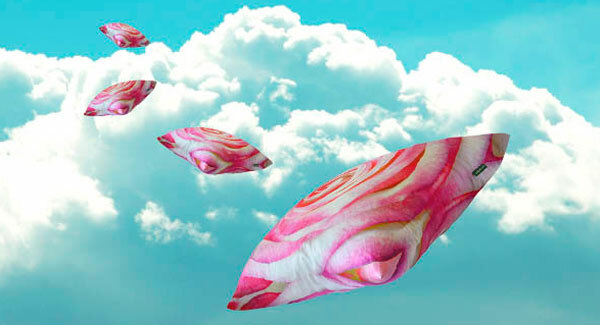 Mostly, I buy the flowers… You can, however, always enjoy roses on Paola Pillows. And never lift a finger except to squeeze that awesome feather down..